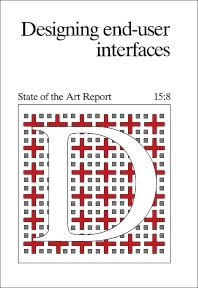 Designing End-User Interfaces: State of the Art Report focuses on the field of human/computer interaction (HCI) that reviews the design of end-user interfaces. This compilation is divided into two parts. Part I examines specific aspects of the problem in HCI that range from basic definitions of the problem, evaluation of how to look at the problem domain, and fundamental work aimed at introducing human factors into all aspects of the design cycle. Part II consists of six main topics—definition of the problem, psychological and social factors, principles of interface design, computer intelligence and interface design, systems aspects of the human/computer interface, and conclusion. This book is recommended for computer designers aiming to understand the user, improve the software and its associated interface, and design hardware that is suitable for use.